At this Roma's Hospitality Centre wedding I had a great opportunity to take amazing first dance photos. One of my signature shots is created using Christmas lights placed in front of my Canon 85 mm 1.2 lens stopped down at F2. That generates huge red globes of light that are in fact foreground bokeh. At the beginning of my Toronto wedding photographer career I perfected this special technique and I am able to do it in such way so I don't risk the shot. The first image of this spread, the bride is giving the groom a kiss on his for head during their first dance. They both are hugging and we can distinguish a hint of a grooms smile. The newlywed couple is surrounded by foreground bokeh created using the above mentioned technique. 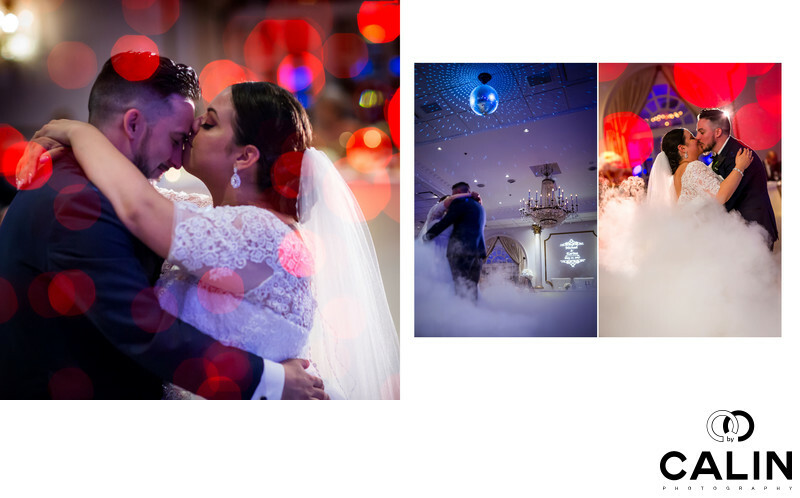 The second image in the series features the bride and groom having their first dance while the whole room is filled with dry ice. That makes them look like the dance on a cloud, a very appropriate image for a first dance. I remember shooting this photograph from a very low angle to capture the bride and groom the lights on the ceiling and the monogram on the wall. The third image captures the moment when the bride and groom kissed during their first dance. For the shot I use the Dutch tilth technique to give the image more dynamism. Besides that I also used the Christmas lights to create element of interest around the bride and groom. Finally in this last image the red lights and of the dry ice smoke frame the bride and groom to complete this beautiful album spread.